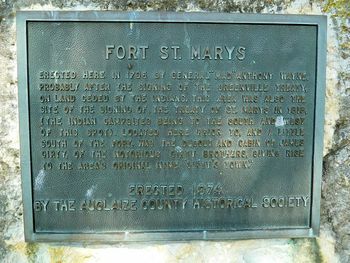 Fort Saint Marys (1794-1796, 1813-1818) - First established in 1794 by General "Mad" Anthony Wayne during the Northwest Territory Indian War and abandoned in 1796. Rebuilt in 1813 during the War of 1812 and abandoned in 1818. In 1794 General "Mad" Anthony Wayne marched his troops toward the heart of the hostile Indian indian country near the present day city of Maumee, Ohio. Along the way, he carefully constructed a line of forts from Fort Washington to Fort Deposit as supply points and to secure communications and supply lines. The forts were about a day's march from each other. General Wayne was the third American general to attempt to control what had become a confederation of hostile Indian tribes with British support, he did not want to repeat the mistakes of his predecessors who both failed with horrific results. 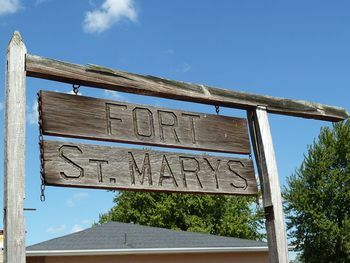 Fort Saint Marys was built as a supply depot with four stockade walls and two blockhouses on opposite angles. Fort Saint Marys was rebuilt in 1813 and garrisoned with troops under the command of Col. Barbee. Also known as Fort Barbee. The Treaty of Saint Marys was signed here on 18 Sep 1818 opening up land for settlement. Marker located in the Old Lutheran Cemetery. Location: Map point is the Marker, Saint Marys, Auglaize County, Ohio. This page was last modified 08:40, 26 March 2019 by John Stanton.